﻿ Why the industrial sand dewatering screen is so hot? Location: Home » NEWS » Why the industrial sand dewatering screen is so hot? Why the industrial sand dewatering screen is so hot? The sand with lower moisture content is well needed and widely used in the market. 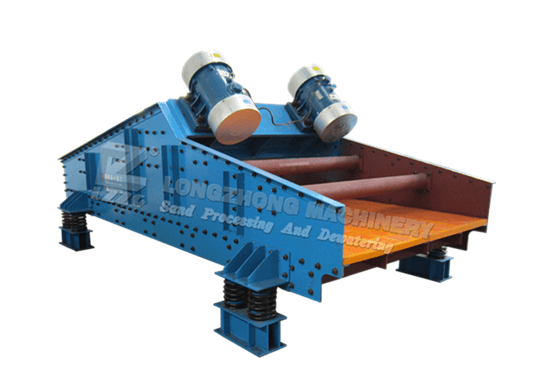 LZZG sand dewatering screen is the best solution to wet sand washed by sand washing machines. It applied for polyurethane plates as dewatering panels, bending a whole steel plate Q345 as its main body. The vibrating motor is also be adopted, which coordinates with universal eccentric and adjustable amplitude. 1. Choose polyurethane screen. Polyurethane screen has several benefits, for instance, no blocking, high dewatering ratio, reliable performance, light weight and long service life. 2. Customized size. According to different situation, not only polyurethane screen hole can be customized, but also its length, width and screen layers can be manufactured. 3. Simple structure, easily install. 4. Bending a whole steel plates as its main body, no welding and no leaking. 5. Final water content of sand down to 12%-15%, convenient in packing and Delivery.